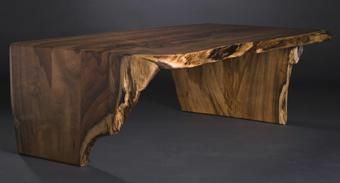 Coffee tables crafted from our large inventory of domestic and imported exotic hardwoods make a unique, bold statement that complements any decor. Each table is designed to take advantage of each slab's unique shape, color and other natural attributes. 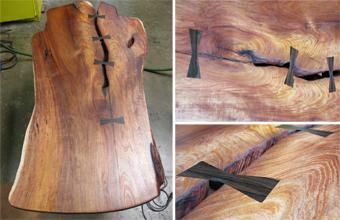 Examples of recent commissions are shown in Hawaiian koa, with a folded miter leg. A Tasmanian black acacia table top illustrates how we can incorporate natural features such as cracks and voids to add unique features and interest to each piece. Dimensions: Dimensions vary based on client requirements and available natural edge slabs and other materials.